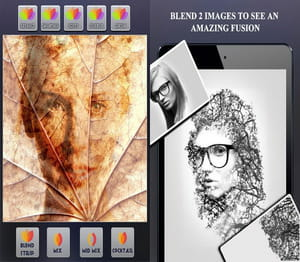 Image Blender Instafusion is an image blender that is developed and published by Tech BLA. The principle is quite simple; the gamer has to take two different pictures and combine them into one. It is possible to add some effects, frames and enhance the picture in question. Fusion: this application enables to combine two images easily. Image Blender Instafusion enables to add collage styles such as Blend, Unstrip, Lightmex and Radial Blend. There are several modes that the user can select. Photo editor: Image Blender Instafusion is integrated with an image editor for this latest version. This enables to add effects (Smartmix, Overlay, Screen, etc.) to the blended image. It is also possible to add frame to the image and adjust some settings to enhance it. Automatic Save option: once the user managed to process to the image blending, Image Blender Instafusion automatically saves it in its database. Indeed, there is a built-in gallery where images will be stored. Sharing option: once images are created, the application lets users share the output to friends and families via Bluetooth or Email. If not, Image Blender Instafusion also offers icons directly linking to Twitter and Facebook.